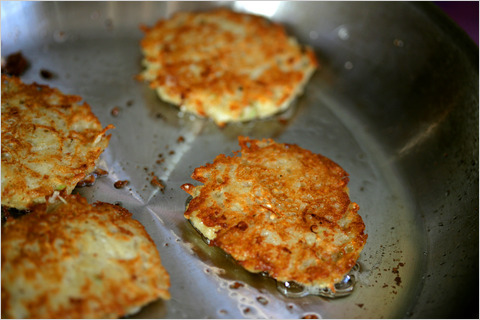 As part of Hanukkah, Jewish families make latkes or potato pancakes and serve them with sour cream and applesauce. They are amazing. Additionally, they make wonderful canapés when topped with smoked salmon and a little creme fraiche. Add a tiny silver of fresh chive and it's epic. 3 lbs of Russet Potatoes, peeled and grated. 1 small Onion, finely grated. 1 small Shallot, finely grated. Grate and drain the potatoes in a dish cloth or cheese cloth. You want them dry. Add in all other ingredients, except for the oil. Heat your oil in a large sauté pan until hot, form your latkes into 3-4 inch patties and gentle slide them into the oil. Fry until they are well browned, and then turn. A fish spatula is perfect. Drain on paper towels and serve immediately with sour cream and applesauce.